Are we actually seeing PlayStation 4 and Xbox 720 video games at E3 and no one's admitting it? That's been a popular theory all week here in Los Angeles and reporters and game creators buzz about the extraordinary-looking gameplay demonstrations of Ubisoft's Watch Dogs and LucasArts' Star Wars 1313. Both games looked way too graphically impressive to believably be running on an Xbox 360 or PS3. So what's the story here? It depends on how you interpret varios winks, smiles and statements. "I think I know which platform that game is for," one top gaming executive said to me while we were discussing Watch Dogs. But he didn't want to blurt it out. "That sure looked like a next-gen game to me," I later said to a Ubisoft developer, who is not on the publisher's Watch Dogs team. He smiled and kept his mouth shut. A couple of days earlier, just minutes after Ubisoft's live gameplay demo of the Grand Theft Auto-meets-Deus Ex Watch Dogs games, Ubisoft spokespeople were stretching this way and that to not answer my simple question of which platforms that game is for. And then we found listings on Ubi's press site for PC, Xbox 360 and PlayStation 3. ... is running on a current-gen console. I pressed Ubi PR again yesterday, and a rep wrote this to me: "So far we have only confirmed PC, Xbox 360 and PS3. However, since Watch Dogs will not be shipping this year, we have time to build content for multiple platforms should we choose to. We'll continue to update you as details become available." 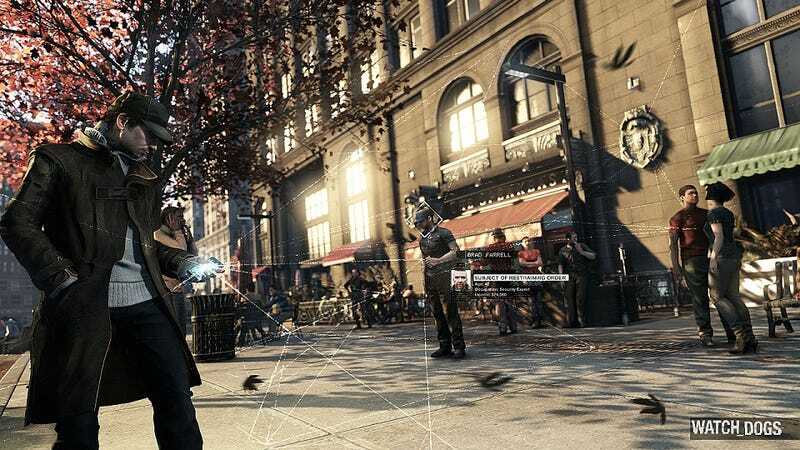 Notice that Watch Dogs didn't appear at Sony and Microsoft's press events, a strange omission for a stunning game that Ubisoft says is coming to those company's current consoles. I'm not sure about Microsoft, but I do know that Sony won't allow developers to run games off of anything but PS3 tech at their conference (another words, no PC-based demos). That might explain why we wouldn't see a demo there, but not even an announcement? Strange. Star Wars 1313 looks even more visually stunning than Watch Dogs. For that one, LucasArts is saying only that the game demo is using a heavily-modified Unreal Engine 3 and is running on a PC. A rep for Epic Games, the company that provides UE3 to studios like Lucas, told me that the version of the Engine that Lucas is using is close to what ran the extraordinary "Samaritan" demo that was shown a year ago at the Game Developers' Conference in San Francisco. That demo, the Epic rep reiterated to me this week, ran on a spec that requires better hardware than we've got in the 360 and PS3 (whether the Wii U could handle it remains an open question; Epic's not saying and we haven't been able to as Nintendo yet). That Samaritan demo was basically Epic's way of suggesting to console manufacturers what kind of hardware power it would be beneficial for them to have in their next consoles. Microsoft and Sony won't talk about their new consoles yet. We know they're working on them. Microsoft's is code-named Durango; Sony's is Orbis. Companies like Ubisoft and LucasArts aren't going to announce those machines for them. But we expect these consoles in fewer than 18 months, and it sure looks like we're getting a glimpse of what games will look like on them. We're also getting a glimpse, clearly, of how good PC games can look right now. And that is exciting, too. There may well be an Xbox 360 and PS3 version of Watch Dogs or 1313, but they probably won't look like what we've seen this week. There will definitely be another Xbox and PlayStation. And how will the games running on them look? I think we've all seen. If not, just press play on the videos in this story. As our Luke Plunkett said of the amazing new graphics tech unveiled by the creators of Final Fantasy this week: "The next generation of consoles may not be at this show, but their graphics certainly are."